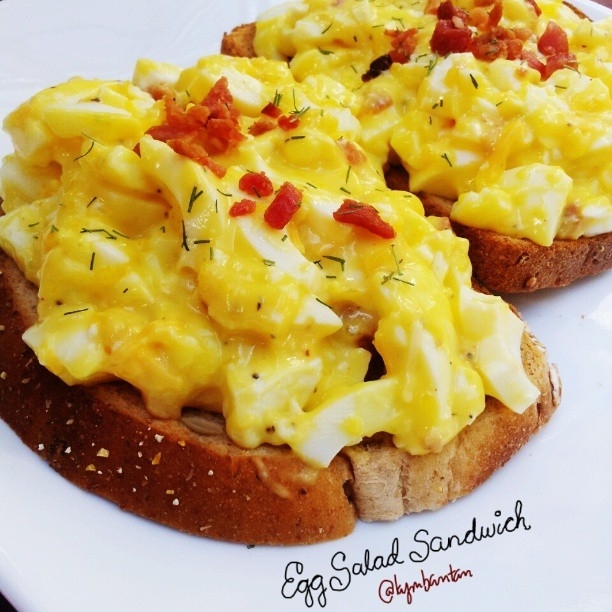 One of my fave snacks: Super-easy-to-make Bacon + Egg Salad Sandwich. Boil eggs to your liking, peel and chop eggs into small pieces, add 2tbsp of fat free mayo, a few squirts of mustard, 2tbsp of bacon bits, salt, and pepper and mix well. Toast 2pcs of whole grain bread and top with egg salad mixture. That's it! When my husband and i buy bread, we spend a few mins inspecting the nutrition info on each bag to make sure we're getting a good amount of fiber... The one we currently buy has 10g per 2slices!